Azerbaijan State Chamber Orchestra invites you to enjoy a concert of classical music. 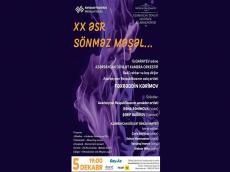 The concert will take place at Azerbaijan State Philharmonic Society on December 5, Day.Az reported. The artistic director and chief conductor of the orchestra is People’s Artist Fakhraddin Kerimov. The soloist of the evening are Honored Artists of Azerbaijan Rena Ragimova (alto) and Sharif Bagirov (clarinet). And there will also be some surprises to delight spectators. The State String Quartet will perform as part of the event. The works by world-famous composers will sound at the concert. Tickets can be purchased at all ticket offices of the city and on the website iticket.az. Azerbaijan State Chamber Orchestra was founded by Fikrat Amirov and Gara Garayev in 1964. Nazim Rzayev directed the Orchestra until 1992 since its foundation. The orchestra toured different cities of Russia, as well as former Czechoslovakia, Poland, Tunis, Bosnia and Herzegovina, and Turkey during this period. The orchestra generally performs works of Azerbaijani composers and premiered works by Western European and Russian composers. The ASCO also performed at the concerts dedicated to the 20th anniversary of the Independence of Azerbaijan organized in Berlin, Paris and Rome in 2011. Azerbaijan State Chamber Orchestra participated at the Azerbaijani Culture Days conducted in Beijing in May 2011, as well as at the 2nd Ramatuelle International Classical Music Festival organized in France in July 2011. The State String Quartet was founded in 1998 and has repeatedly performed in France, Germany, Turkey, Greece and Serbia. The quartet includes Jeyla Seyidova (first violin), Honorary Artist of Azerbaijan Republic Soltan Mammadova (second violin), Honorary Artist of Azerbaijan Republic Vakhtang Imanov (viola) and Honorary Artist of Azerbaijan Republic Alexei Miltykh (cello).